When you register, contribute, sign up to volunteer, launch a campaign through the Petition Platform or take any other action on our Site, we may ask you to give us contact information, including your name, address, telephone number and/or e-mail address. We may obtain information about you from outside sources and add it to or combine it with the information we collect through this site. We use this information to operate this site, send you news and information to you about Mijente, solicit your participation in Mijente programs, events and activities, and in the case of the Petition Platform, use information about you and your Petition signers as set forth below in the Terms of Service. We use your e-mail address to send such information by e-mail and may use your telephone number to call you for these purposes. Submitting your personal information including e-mail address on this page will sign you up to receive e-mails from Mijente and MSC. Mijente complies with the Childrens’ Online Privacy Protection Act. Mijente does not solicit and does not accept personally identifying information from any person less than 13 years of age. Visitors to this site who are under 13 years of age should not use this site except under the supervision and with the assistance of their parent or legal guardian, and should never submit any personally identifying information to the site. For example, visitors under 13 years of age should not make donations or take any actions on or through this site. When you make a contribution to Mijente through this website, we collect credit card information from you. That information is used solely for processing your contribution; is not maintained by Mijente; and is never disclosed to anyone, for any other purpose other than for processing your contribution, under any circumstances. Mijente uses industry standard security measures to protect against the loss, misuse or alteration of the information under our control. Our server is located in a locked, secure environment. All supplied credit card information is transmitted via Secure Socket Layer (SSL) technology and then encrypted into our payment processing provider’s database. Permission to access your information is granted only to you and to Mijente employees or contractors who need to know that information to provide services to you and who are required to keep the information confidential. Although we make good faith efforts to store information collected by this website in a secure operating environment, we cannot guarantee complete security. We may also use third-party services such as Google Analytics. This helps us understand traffic patterns and know if there are problems with our website. We may also use embedded images in emails to track open rates for our mailings, so that we can tell which mailings appeal most to Mijente supporters and activists. Google Analytics collects only the IP address assigned to you on the date your visit this site, rather than your name or other identifying information. We do not combine the information collected through the use of google Analytics with personally identifiable information. Although Google plants a permanent cookie on your web browser to identify you as a unique user the next time you visit this site the cookie cannot be used by anyone but Google. You can prevent Google Analytics from recognizing you on return visits to this site by disabling cookies on your browser. Additional information collected through Google analytics and DoubleClick may include: remarketing with Google Analytics; Google Display Network Impression Reporting; Google Analytics Demographics and Interest Reporting; Integrated services that require Google analytics to collect data via advertising cookies and identifiers. The privacy policies and practices contained in this Privacy Statement do not apply to ANY external links. This Privacy Statement only applies to our site or any future sites that we may develop. It does not cover sites that are linked to by this site or sites for which we are not responsible (“linked-sites”). These linked-sites will have their own policies and practices which may be different from ours. We therefore encourage you to familiarize yourself with the policies and practices of the linked-sites, especially if you provide personal information to them. The Petition Platform is an online application allowing individuals and organizations to initiate an online petition campaign and send emails encouraging recipients to electronically sign the petition. You or your organization will be given access to the Petition Platform to be able to create a petition (“Petition”), obtain a link to the petition page on the Petition Platform website (the “Site”), and send the link in a message to email addresses from the Partner’s list. The term “you” in these TOS includes your organization, if your organization is creating the Petition and/or signs up for a Digital Partner Program account. In no event can the Petition Platform be used for any commercial or for-profit endeavor or purpose. If a Petition references a state or local elected official or candidate for state or local office, it is your responsibility to determine if the dissemination of the petition or use of the Petition Platform constitutes a contribution for purposes of any state or local campaign finance law; and to refrain from disseminating the petition if its dissemination would result in such a contribution. ; or would require registration or reporting by Mijente under any state or local law applicable to grassroots lobbying. In no event can a Petition advocate the election or defeat of any candidate for state or local office; or refer to a candidate for state or local in connection with or in the context of any election campaign or in his or her capacity as a candidate. is inconsistent with the goals, objectives, philosophies, and/or purposes of Mijente. Mijente Dissemination of Petition. Mijente will have the right, in its sole and absolute discretion, to disseminate any Petition to all or any portion of Mijente’ s own list of email records, during all or any portion of the period during which the Petition is posted on the Petition Platform. Such dissemination will be referred to as Mijente Distribution. Access to and Use of Identity of Petition Signers. Each recipient desiring to support a Petition will be asked to provide his or her name and zip code, to be transmitted to the public official, agency, corporation or organization to whom or which the Partner Petition is directed. Partner will have the right to maintain the names and zip codes of Partner Petition signers. Access to and Use of Email Addresses. Each recipient of a Petition who signs on to the Petition as a result of an email sent by you (“Petition Signons”) will be advised on the petition page that he or she is opting in to receive future e-mails from Mijente. Mijente and its sister organization, MSC shall have the right to send emails to all email addresses of Petition Signons. Intellectual Property Rights—(a) Petition Platform. All copyright and other rights in and to the computer programs, computer applications, web applications, database programs, web content files and all written, graphic, audio and audiovisual works incorporated into and utilized on the Petition Platform and the Site shall be and remain the sole and exclusive property of Mijente (“Mijente Intellectual Property”). Partner may not copy, modify, publish, transmit, distribute, perform, display, or sell any such Mijente Intellectual Property. (b) Petitions—You retain the copyright and other intellectual property rights in and to the content of each Petition you create, to the extent that you have has such rights under applicable law. Notwithstanding the foregoing, you understand and agree that by submitting a Petition, you grant to Mijente and MSC (a) a royalty-free, world-wide, fully paid-up, perpetual, irrevocable, non-exclusive right and license to (i) use, reproduce, distribute, modify, adapt, and publicly display the Petition and its content within the Site and/or on the Petition Platform; and (ii) use and reproduce (and to authorize third parties to use and reproduce) any of the content of the Petition in any or all media throughout the world for the purpose of transmitting or publicizing any Petition and/or the contents thereof and or any information or data relating to such; (iii) the perpetual and irrevocable right to delete any or all of the Petition, whether intentionally or unintentionally, and for any reason or no reason, without any liability of any kind to you or any other party; and (c) a royalty- free, fully paid-up, perpetual, irrevocable, non-exclusive right and license to copy, analyze and use any of the Petition, results and numbers of sign ons, as Mijente may deem necessary or desirable for purposes of enhancing, debugging, testing and/or providing support services in connection with the Site or the Petition Platform. Representations and Warranties as to Content. You represent and warrant that no Petition will include or incorporate any material, writing, visual work, symbol, logo, trade name or data of any kind in which any third party has a copyright, trademark or other right without obtaining the prior express written consent of the owner of such proprietary rights. You further represent and warrant that the content of any Petition will not be defamatory, libelous or slanderous in nature and will not violate or promote any violation of any federal, state or local law or the laws of any country. Limitation of Liability. (a) Mijente reserves the right to interrupt the Petition Platform or the Site with or without prior notice for any reason or no reason. Partner agrees that Mijente will not be liable for any interruption of the Petition Platform or the Site, delay or failure to perform. 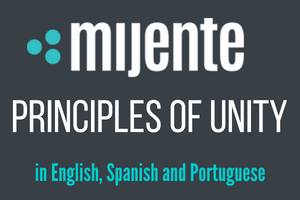 Mijente assumes no responsibility for any error, omission, interruption, deletion, defect, delay in operation or transmission, telephone system or communications lines failures, or theft or destruction or unauthorized access to, or alteration of, user communications. Mijente is not responsible for any problems or technical malfunction of any telephone network or lines, computer systems, servers or providers, computer equipment, software, failure of email or players on account of technical problems or traffic congestion on the Internet or at the Site or combination thereof, including injury or damage to your or to any other person’s phone or computer related to or resulting from participating or downloading materials in connection with the Petition Platform. (b) Under no circumstances will Mijente be responsible for any loss or damage, resulting from anyone’s use of the Petition Platform or the Site or any interactions between you and persons proposing or signing petitions or between signers, whether online or offline. The Petition Platform is provided “AS-IS” and (to the extent legally permitted) Mijente expressly disclaims any warranty of fitness for a particular purpose and further expressly disclaims any implied warranty and terms and conditions. Mijente cannot guarantee and does not promise any specific results from use of the Petition Platform or the Site. (c) Except where restricted or prohibited, in no event will Mijente be liable to you or any third person for any indirect, consequential, exemplary, incidental, special or punitive damages, including lost profits arising from Partner use of the Petition Platform or the Site, or of termination of your account, even if Mijente has been advised of the possibility of such damages. Some jurisdictions do not allow the disclaimer of warranties or exclusion of damages, so such disclaimers and exclusions may not apply to Partner. You agree to indemnify and hold Mijente and MSC harmless form and against any damages or losses incurred because of or resulting from any claim, action, suit, proceeding or investigation asserted or initiated by a third party, based upon or arising out of the breach by you of any warranty, representation or covenant of Partner set forth in these TOS. Partner is a nonprofit organization exempt from taxation as a charitable or educational organization under section 501(c)(3) of the Internal Revenue Code of 1986 as amended (the “Code”); a social welfare organization exempt under section 501(c)(4) of the Code; a labor organization; or a political organization or committee. Partner does not sell or rent email addresses to other organizations; sends emails only to recipients who have opted-in to receive e-mails from Partner; and includes an unsubscribe link in every e-mail sent. Partner uses a standard tool or application to manage its email list. Partner is committed to developing effective online petition campaigns incorporating issues that affect the Latinx community. Download and retain the full list of Signon e-mail addresses and associated records, and to e-mail records on that list at any time, for any purpose serving the Partner’s mission, operation or programs. Mijente reserves the right to terminate the account of any Partner for violation of any of these TOS.